Grab your wellies and join us for an afternoon of festive food and fun on the farm! We have stalls available for food and drink producers to trade at The Apple Fair 8th October 2017, interested? We thought we'd share this Enfield Food Festival blog with you from Kim Walker & Vicky Chown as they have some great uses for the elderflower including a gorgeous cordial recipe for you to try. After the horrors of Saturday night in Borough Market, on Sunday morning, Forty Hall Vineyard was a peaceful haven. I went along to their 'open vineyard' day to celebrate English Wine Week and the release of their 2016 Ortega wine . There is generally a low expectation of the quality of the wine (let's face it, a wine produced from grapes grown in Enfield, North London doesn't raise high hopes.). You will be mightily surprised though!! it's a joyful moment when the wine hits your palate and it dawns on you that the wine tastes really good. What a fantastic asset we have here in North London - a vineyard that produces good wine! Sarah Vaughan Roberts, who founded the Vineyard as a social enterprise in partnership with Capel Manor College, explained the challenges the vineyard has recently faced with an unusually late frost in April which has had a devastating impact on the vines. Thankfully there are signs of renewal but the it wont be clear how much damage there is until the end of summer as we approach the harvest time in September, but here will undoubtedly be an impact upon the volume of wine that can be produced. This matters greatly as the wine sales pay for the running of the vineyard as a social enterprise, promoting good mental health, rehabilitation and well being for local people through "green exercise" . The vineyard are raising money through donations and you can also support the vineyard by buying the wine from the Forty Hall Farm Shop, Forty Hall Estate, Enfield and online soon. You can tour the vineyard at the Food Festival on August Bank Holiday and watch out for events that the Food Gatherer will be organising in the vineyard over the summer too! 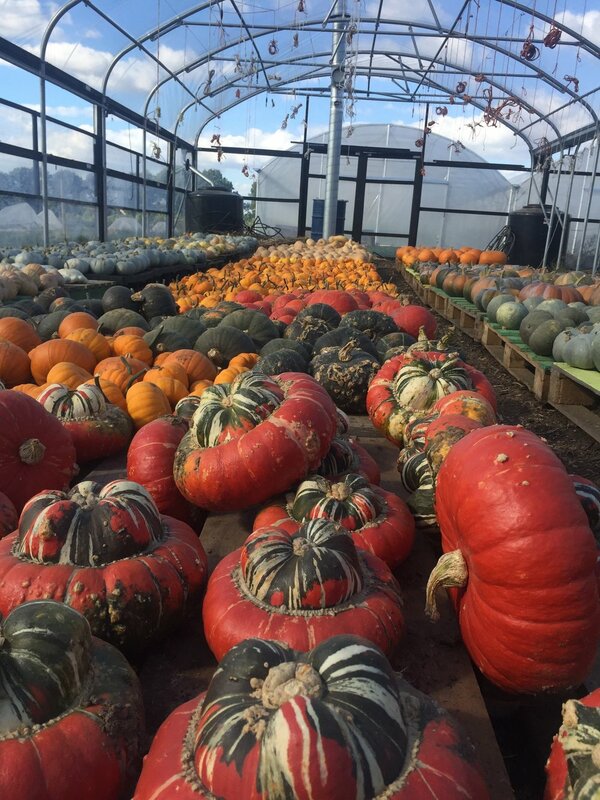 The pumpkins are 'curing' in the polytunnel at Forty Hall Farm and they look spectacular. From Turk's Turban to Spaghetti squash the varieties this year are truly wondrous. They'll be in the Enfield Veg Bags and selling in the farm shop soon. 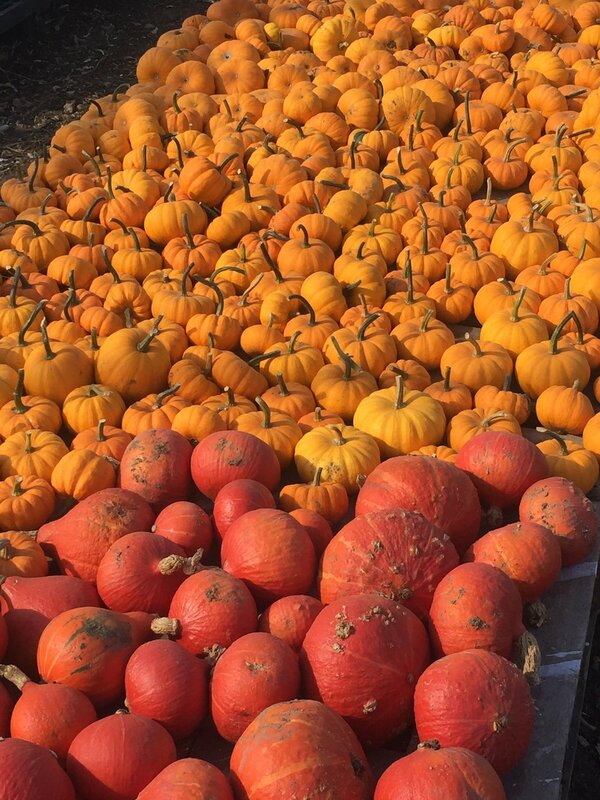 Visit our Autumn recipes for delicious squash recipes too. Holtwhites Bakery's Richard Copsey gets to work kneading his dough in the bakery. It's good to see how a master does it! Congratulations to Forty Hall Farm Vineyard, Gourmet Goat and Holtwhites Bakery who were all finalists in the Urban Food Awards. Last year's finalists included Tottenham's Wildes Cheese and Forty Hall Farm for their market garden salad, so there's a lot for the food lover to feel proud of here in North London!